From the Pulitzer Prize-winning playwright and author of the essay collection Shiksa Goddess (“Utterly delicious”—Judith Thurman), a dazzling debut novel, a comedy about New York’s urban gentry living in a post-9/11 world—the arbiters of fashion and the doyennes of charity balls; about the rich and the nouveau rich(er), the glamorous and the desperate to be. We meet Francesca Weissman, the Upper East Side pediatrician rated number one by Manhattan magazine, who takes us into the upper strata of privilege and aspiration (she’s originally from Queens with a father in hosiery; life on the fringes of glittering New York is fine with her) . . . Samantha Acton, thoroughbred descendant of the Van Rensselaers and the Carnegies, who defines the social order in the great tradition of Mrs. Astor and Babe Paley . . . Judy Tremont from Modesto, California, daughter of a cop—her life’s work, her obsession, is New York society and its richest families . . . Barry Santorini, Republican, moviemaker, winner of twelve Oscars, and his wife, the Italian supermarket heiress and former media rep for Giorgio Armani . . . and many more. As Elements of Style opens out, we see a madcap mosaic of the social lives and mores of twenty-first century Manhattan—of romance, work, family, and friendship. 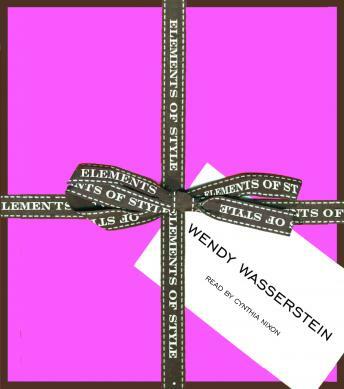 Satiric, fierce, touching—and deliciously Wasserstein.